With its new R&S ZVA family of vector network analyzers, Rohde & Schwarz is taking a future-oriented approach. The analyzers offer a perfect balance between measurement speed, dynamic range, flexibility and precision, making them ideal for present and future measurement tasks. 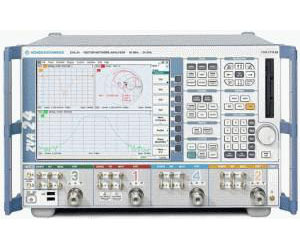 Rohde & Schwarz previously set standards in RF and microwave measurements with its R&S ZVR family of network analyzers, and now continues this success with the R&S ZVA. The fundamental mixing concept employed by theÜreceivers ensures high sensitivity and a wide dynamic range. Extremely fast synthesizers make for short measurement times. Its excellent characteristics, new functionality, sophisticated GUI and extremely high flexibility make the R&S ZVA an indispensable tool for demanding measurement tasks in labs and production.